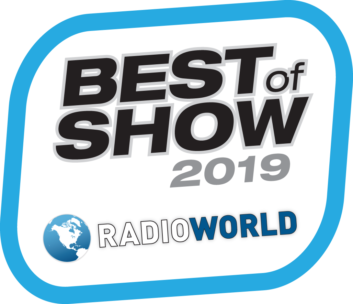 Radio World announced its recipients for the 2019 Future Best of Show at NAB Awards, listed below. The award program is intended to honor, and help companies promote, outstanding new products exhibited at the 2019 spring NAB Show. Products are evaluated by a panel of engineers and industry experts, and winners are selected based on innovation, feature set, cost efficiency and performance in serving the industry. Winning products were chosen from among nominations submitted for consideration by exhibitors. Companies pay an entry fee; not all entries are winners. All new products, both nominees and winners, will be highlighted in a Program Guide to be emailed next month to 100,000+ readers of Radio World, TV Technology, Digital Video, Video Edge, Government Video, Pro Sound News and Sound & Video Contractor. Each of those brands announces its own list of recipients. Information about the program can be found here and here.